It’s that time of day again! 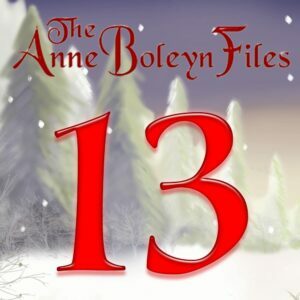 Yes, it’s time for today’s treat from the Anne Boleyn Files Advent Calendar! Today’s Christmassy Advent Calendar treat is from Lorna Wanstall, who many of you will know from her comments and posts on the Anne Boleyn Files and Tudor Society sites and forums. She’s a realm Tudor history lover and is also working on a novel about Mary, Queen of Scots. Thank you so much, Lorna, for contributing today’s treat! All you have to do to enjoy treat 13, and the previous 12, is to either click on the picture of the number 13 here or scroll up to the top of this website and click on the link to the calendar in our cover image. You can do that on a daily basis to enjoy each day’s treat at a time to suit you. I am always surprised by the things the Puritans didn’t approve of. Pudding? Fun and interesting information. Thank you Lorna. I never realised that the 12th cake was so ancient, and how interesting to discover it was the Romans who invented it, I always thought it was a Tudor dessert you learn something new every day, neither did I know that they waited on the slaves during the celebrations, this puzzles me because the Romans were very cruel and so we see how the ‘Lord of Misrule’ came about, I did know however about the Christmas pudding or frumenty as it was called in Tudor and Stuart times, I doubt if we would relish it today, our version which hails from the Victorian era is much lighter and sweeter, but I must admit, I do prefer the non alcoholic ones, and I find brandy cream way too heavy, the normal cream I prefer or a good quality vanilla ice cream as an accompaniment, I know what you mean about the Puritans Michael, they really were a miserable lot, I think even laughter was cheered on, their reign was so oppressive when Charles 11 returned to claim his crown after years of exile, the whole country were overjoyed. The traditional view of the three Kings is that one was young, one was middle aged and one was ancient. Also one was from India, one from Africa and one from Persia. The African King was probably from Ethiopia where there is a long ancient tradition of many stories and paintings about the Wise Men, on many Church walls. In Persia most people were followers of Zoroastrianism who was a teacher of the Lord of Light, Ahura Mazda, and he was a teacher who is still revered today but also saw the coming of Jesus and the Wise Men. They are mentioned many times in Persian writing. Of course we only know all this from 200 years ago as the Greeks couldn’t read Persian. This is why the Kings all have odd names in Greek which bear no resemblance to the Hebrew or Persian. Some English scholars saw the Persian alongside Greek Hebrew and Aramaic and was able to translate it. This was probably because it also has the same roots as English. Zoroaster was also meant to be a reincarnation of Ahura Mazda and he saw other rebirths in history and predicted that the last prophet would be born on 25th December. Some people see this as a significant date especially as the majority of people for centuries before Jesus celebrated special events around the Reborn Sun on 25th December, the date Christians later took as Christmas Day. The cake sounds marvellous and its ancient origins show how the Romans gave us such a lot of modern stuff. It is no surprise as they loved their food that they would invent a tasty fruit pudding and rich cake for this time of year. The Lord of Misrule must have really caused marvellous chaos. I don’t think you would want to run naked through the streets of Rome in December, as it would be very cold, even though it’s normally hot. The old symbols of the blood of the crucifixion in the berries and crown of thorns in the holly gave new meaning to a festival filled with warm celebration, light and hope for renewal. In the darkness there was hope of light returning to the world, through sacrifice.